A large bramble patch is reduced in size to restore lost grassland while sycamore saplings are thinned out to enhance a wooded area and improve views over Clevedon Bay. By removing bramble grassland is reclaimed; trees thrive & are are shown to advantage. The area nearest the cricket pitch is tidied by cutting back encroaching vegetation. The south-facing grassland slope is mown in late summer to control the recolonisation of scrub species. The remaining mature trees thrive, enhancing the landscape and views. Although pretty, non-native everlasting pea is very invasive and must be removed from grassland. Brambles have produced fresh shoots and must be grubbed out by the roots. Despite a sustained heatwave, invasive, non-native & deep rooted everlasting pea thrives in grassland. It is pulled by hand as is toxic ragwort and non-native purple toadflax. Young spear thistles and nettles are forked out to allow grassland to re-establish, and ash saplings are thinned out and cleared of bramble beneath. The species rich grassland plateau is extended by cutting back and digging out bramble and other scrub species. A view over Clevedon Bay reappears after tree thinning. The top of the hill is mown annually by tractor while the Woodcutters brush-cut and rake up other, less accessible areas to promote good grassland. After clearing sumac trees and scrubby areas grasses and wild flower species return. At the end of the main flowering period, vegetation is cut to encourage fresh growth of valuable grassland species. Rank weeds may first be pulled by hand to prevent seeding. Non-native, invasive everlasting sweetpea is mown again and raked off (3rd time this year) and ragwort, which is poisonous to horses andcattle, is pulled from the grassland. Flowering species colonising a slope (cleared of scrub in the winter of 2015/16) are left to flourish while a neighbouring patch of annual sow thistle is cut to reduce competition. Elsewhere, fresh suckers of sumac are brush-cut for the second time this year. Annual sow thistle is cut to reduce competition with good grassland species, everlasting sweet pea is strimmed again, and ragwort and some thistles are pulled from grassland. Brambles are cleared and the remaining sumach is grubbed out and burnt on site. Invasive, non-native Stag’s horn sumach has spread from neighbouring gardens, taking over more valuable grassland year by year, and needs to be removed. Sycamore trees in adjacent woodland are thinned to improve woodland quality and views over Clevedon Bay. Brambles and scrub elder are cleared to extend the grassland area as far as the old lime kiln track that runs across the slope, while preserving a thicket habitat higher up. Follow-up scrub clearing continues, as well as clearing of new patches with the aim of restoring views over Clevedon Bay. 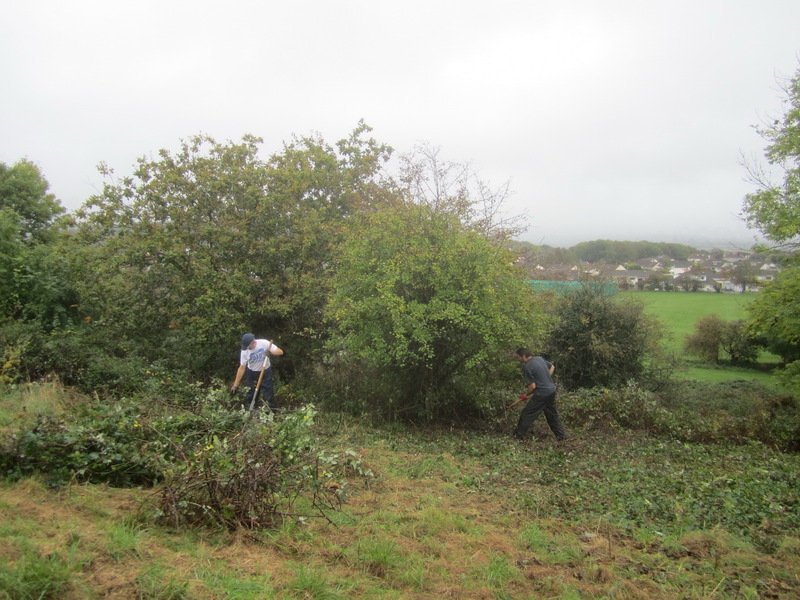 The winter programme starts with more bramble clearing to increase the area of grassland. Grassland restoration continues – the lower slope is mown again. Certain invasive thistles are pulled or cut while the everlasting sweet pea population is controlled by scything. Nettles and bindweed as well as annuals including sow thistle and goosegrass quickly re-colonise the slope cleared of scrub last December, and are scythed and then raked off. Follow-up scrub control includes the brush-cutting and scything of spring regrowth. A programme to control invasive everlasting sweet pea in the grassland starts by the pulling of new shoots. This non-native species develops massive woody roots, difficult to remove. Nettles are the first to grow back after scrub clearing this slope last winter and need to be removed along with bramble stumps to allow good grassland species to re-establish. At the top of the hill an area of bramble and self-seeded ash is cleared in order to reclaim valuable grassland. Cut brash is ‘lost in the scrub’ nearby to create wildlife habitat piles. Bramble cutting continues, leaving a central thicket to provide a wildlife habitat. Remaining bramble stubble on the cleared area is trimmed, raked off and burnt. Removing the lower branches of a large, spreading oak tree significantly enhances the view from seats on the hilltop while improving the form of the tree and allowing sunlight to the ground beneath. Bramble clearance continues on the slope overlooking the cricket field. Work starts on clearing scrub from the top of the south-east slope overlooking the cricket ground. 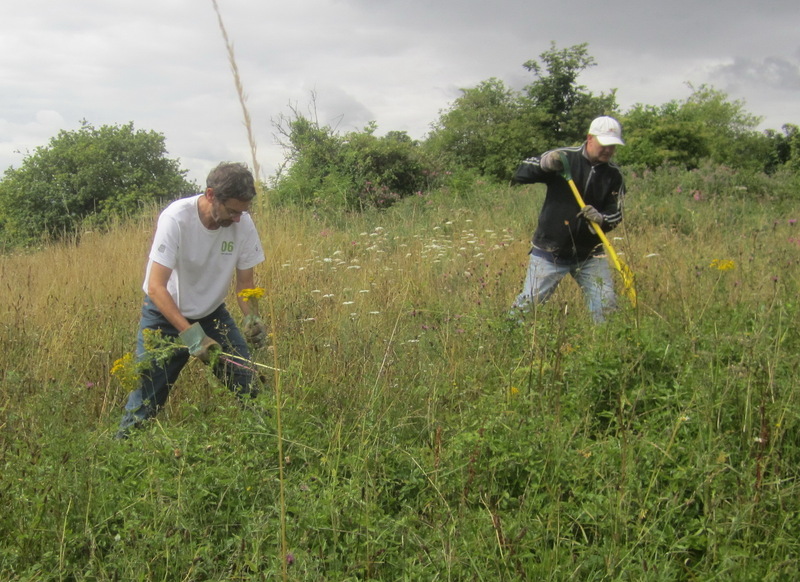 Brambles and small, self-seeded saplings are cut as the first step in restoring the grassland. Mature native trees will be left for their wildlife and amenity value. The population of this native plant needs to be controlled as it is not only invasive, competing with valuable, less vigorous wild species, but when eaten is very poisonous to large domestic animals particularly horses.